Protect your operations from high wind loads, contaminates, and energy losses with durable doors, last opening speeds, and reliable operations. Keep traffic moving with a proven rubber door system that has a compact, heavy-duty operation with minimal moving parts and a collision-resistant rubber curtain. Boost your bottom line with a tried-and-true design that improves overall productivity while reducing operating cost and safety hazards. Key technical features of our rubber doors include a space­ conserving profile, heavy-duty steel construction, impact-proof rubber curtain, patented Windlock design, fail-safe safety systems, chain hoists tor manual egress, low maintenance components, and integrated drives and controls. The Albany UltraTough high-performance rubber door is a strong, fast, and reliable door that works even in the harshest conditions. With this ruggedized rubber door, you will reduce energy costs, safety risks, and weather-related downtime. 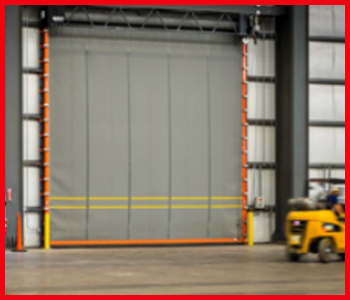 These extra-thick high speed doors have an UltraStrong rubber curtain (lifetime warranted) that can withstand accidental impact from collisions, keeping your workers secure, and your operations going. From forklifts to heavy equipment, the ASSA ABOY UltraBig high­ speed rubber door handles large openings with speed and reliability, even in the harshest environments. The UltraStrong curtain protects against extreme temperatures while the Gusset and Windlok system keeps the door functioning in wind of up to 20 psi(88mph}. Select the rubber door entrance system that gives you the best advantage. Contact our entrance experts to request a custom door configurator,3D CAD drawing, product assistance, or a quote.